The Cavision MB4512FP 4 x 5.65 Matte Box Package is suitable for use with Cavision DSLR shoulder pad system packages or with an existing 15mm rods support system. The package includes the MB4512H-2 4 x 5.65 Hard Shade Matte Box, the ARP1210 120 to 100mm Step Down Insert Ring, the ADU100-D45 100mm Donut Adapter Ring for 60-95mm Diameter Lenses, the MBF-5PA Expandable Top French Flap, the R156025 Front Bracket for Connecting to 15mm (60mm Spaced) Rods, and the RST2550 T-Part. 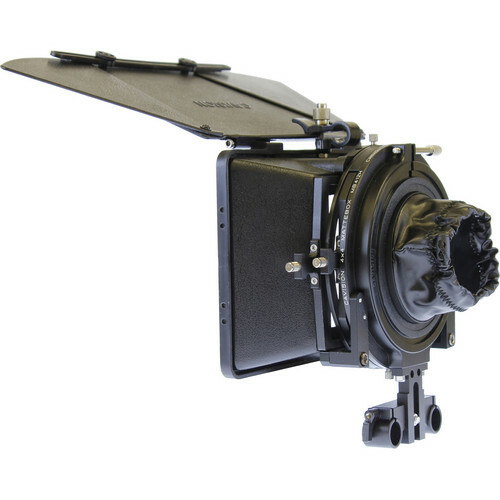 The included MB4512H-2 4 x 5.65 Hard Shade Matte Box can be used as a clamp-on or with 15mm rods support. The included ARP1210 120 to 100mm Step Down Insert Ring fits into a matte box back mount opening (or plastic insert ring opening) with a diameter of 120mm and steps down to an opening with a diameter of 100mm. The included 100mm ADU100-D45 Donut Adapter Ring is suitable for DSLR or other external focus lenses. The included MBF-5PA Expandable Top French Flap features expandable wings that allow one to better flag off extraneous light, but still allow the flap to be completely collapsed for easy storage and carry. The included R156025 Front Bracket fits 15mm rods with 60mm spacing. The included RST2550 T-Part fits all Cavision matte boxes up to 4 x 5.65 sizes. Box Dimensions (LxWxH) 10.4 x 10.4 x 4.85"